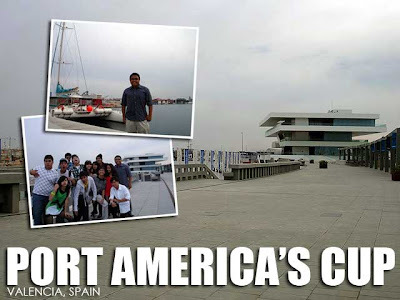 Valencia hosted the 32nd America's Cup, the most prestigious regatta in the world, in 2007. The race is usually held in the country of the defender or the winner of the previous race. Alinghi, a Swiss team won the 2003 race. And since Switzerland is a land-locked country, Valencia was chosen to host the next America's Cup. The 2007 regatta also marked the first time since it was first held in 1851 that the race returned to Europe. 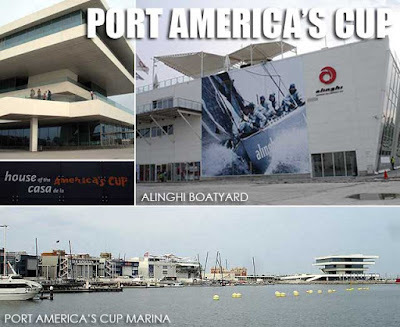 The Port America's Cup Marina was built to host the race. And since a lot of people had suggested we pass by since there are a lot of great restaurants and bars there, we decided to do that for our last night. Sad to say, the place was empty on a Thursday night. It turns out, since the race was completed, activity slowly died down. We got to see the boat yards of the different teams. But that was all. Restaurants and bars were closed that night. I wonder though how it looks like during weekend nights. So we just walked over to neighboring Paseo Neptuno for a light dinner and some drinks.